Disguise bulky utility boxes or meters in your yard with the Short Dolomite Cover Rock. This artificial rock easily fits over any item smaller than 15.5" x 22" x 15". The polyurethane construction allows this lightweight item to be placed anywhere in your lawn. Use just one rock to cover an irrigation valve or septic vent pipe, or use a group of three for natural looking landscaping. The brown fieldstone color will last for years, as it is locked into the polyurethane with a special coloring system. The construction is also resistant to freezing and thawing, for years of use. 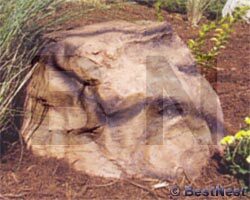 Hide unsightly fixtures in your lawn with the Short Dolomite Cover Rock. As each finish is hand applied, individual items may vary. Note: Interior dimensions may vary slightly due to the manufacturing process.